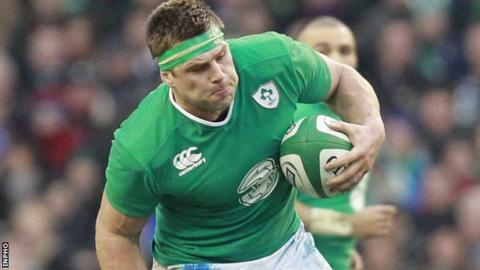 Flanker CJ Stander believes South Africa have already dismissed Ireland's chances for June's three-Test tour. Ireland's South Africa-born forward revealed the Springboks have supposedly "written off" the Irish following their failed Six Nations title defence. The Six Nations champions had to settle for third place this year. "They are writing us off over there because of a few losses here and there, and because we weren't chasing the Six Nations title," said Stander. "I have the family in South Africa, and they keep me up to date with what's going on there," added the Munster forward. Stander left his native South Africa for Munster in 2012 after being told he was too small to play back-row for the Springboks, and now believes Ireland must battle home expectations on tour this summer. "In your head going down to South Africa it's going to be a big challenge, you're going to have to be very physical, they are big boys. "They are a great team, and everyone knows that. But if you're written off and categorised as the underdogs, then that's always something extra to fight for, to prove that wrong. Stander, who has won five caps for his adopted nation after qualifying on residency, has seized his chance during injury-hit Ireland's Six Nations campaign, capitalising on the absence of his Munster colleague Peter O'Mahony. The forward has impressed, starting every match at blindside flanker and boosting head coach Schmidt's options for June's tour to South Africa. Captain Rory Best insists Ireland are more than capable of winning their first Test against the Springboks, but Schmidt will be sweating on a number of long-term absentees. O'Mahony and lock Iain Henderson are expected back fit in time to tour, but Ireland would certainly be boosted by the return from hamstring trouble of tighthead prop Marty Moore. Schmidt insisted Stander's performances would have O'Mahony "looking over his shoulder" as he fights for fitness for the summer tour following knee surgery. Stander offered a wry smile when quizzed on a potential tussle for Ireland's blindside spot with his Munster team-mate and close friend. "Luckily we're good buddies, and that jersey is always going to be there for someone else," said Stander. "Boys are going to come back, there's always big competition in any team for the back-row. "So it's going to be tough to keep that spot, but any player who wears that jersey, I'll support him and I know they'd support me too."